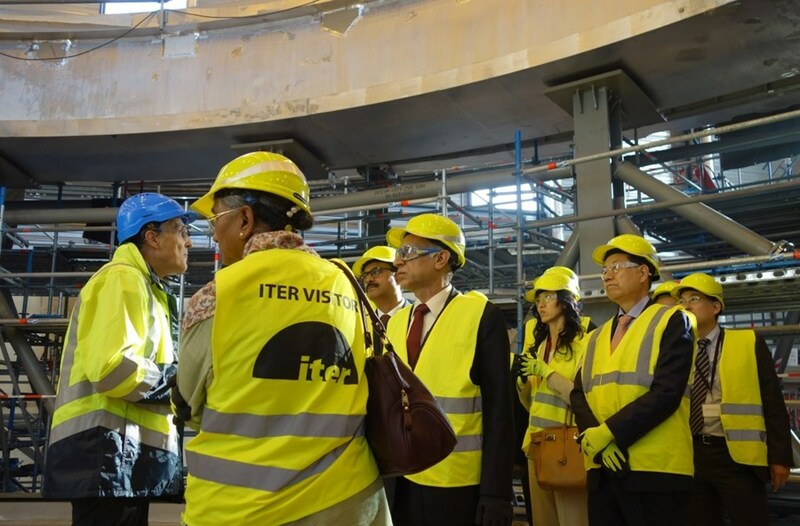 Working as an integrated team, the ITER Organization and seven Domestic Agencies are continuing to meet the project's demanding schedule to First Plasma in 2025. 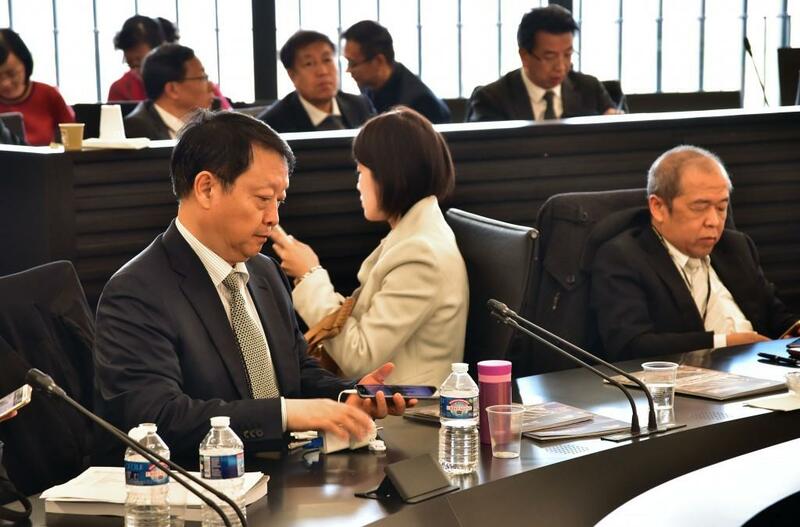 Pace and performance were confirmed this week at ITER Headquarters by senior representatives from China, the European Union, India, Japan, Korea, Russia, and the United States, who had gathered for the Twenty-Third Meeting of the ITER Council. The ITER Council convened on 14 and 15 November under the chairmanship of Arun Srivastava from India (front row, centre). On the program this time: project performance and the preparations underway for the machine assembly phase. Every six months, the governing body of the ITER Organization meets to evaluate project progress on the basis of detailed performance metrics that track manufacturing, construction, and installation activities. 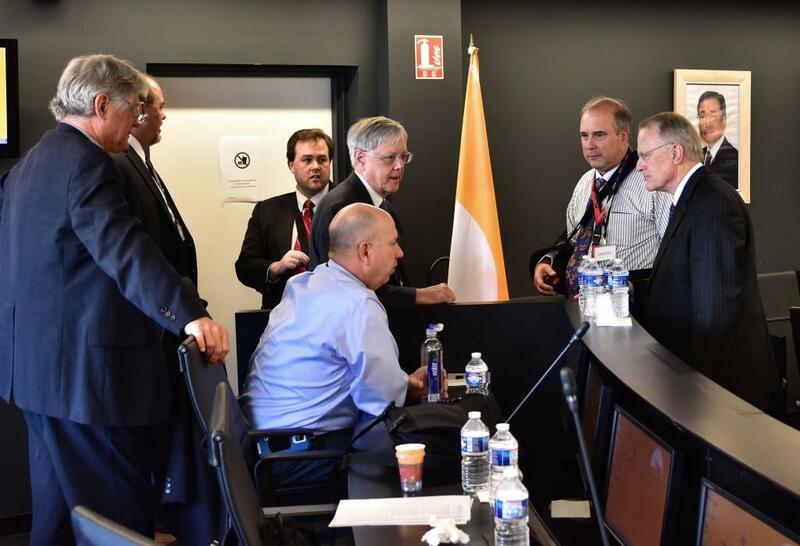 The Twenty-Third Meeting of the Council, which took place on 14 and 15 November at ITER Headquarters, was no different. 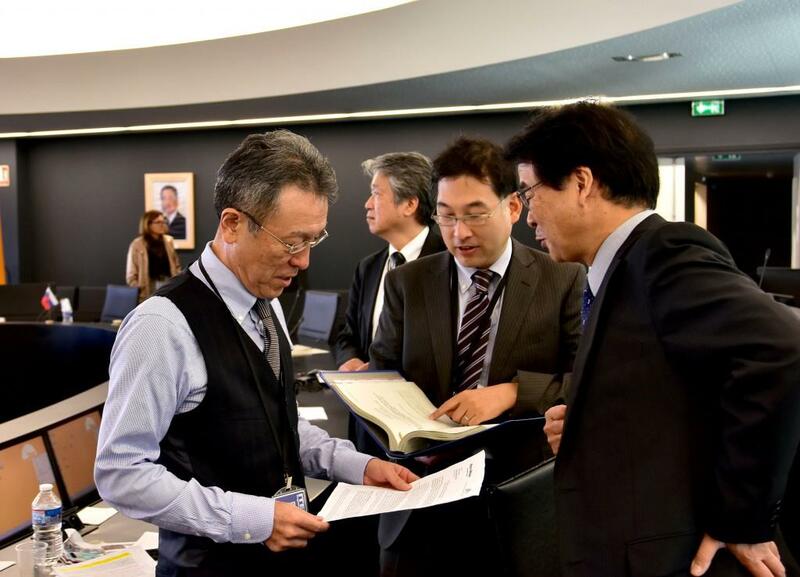 By reviewing the latest reports and indicators on technological and organizational performance, the Council was able to confirm that the project has completed nearly 60 percent of the work scope to First Plasma. Since January 2016, ITER has achieved 36 scheduled Council-approved milestones, including the completion in August of the concrete crown that will receive the full weight of the machine, and the timely manufacturing and delivery of the first flux loop magnetic sensors for the ITER vacuum vessel. Project progress is tracked against the 2016 Baseline schedule, which was endorsed by the ITER Council in November 2016 as the fastest technically achievable path to First Plasma, and the Revised Construction Strategy, which has been developed by the ITER Organization to optimize equipment installation in the Tokamak Complex Building. 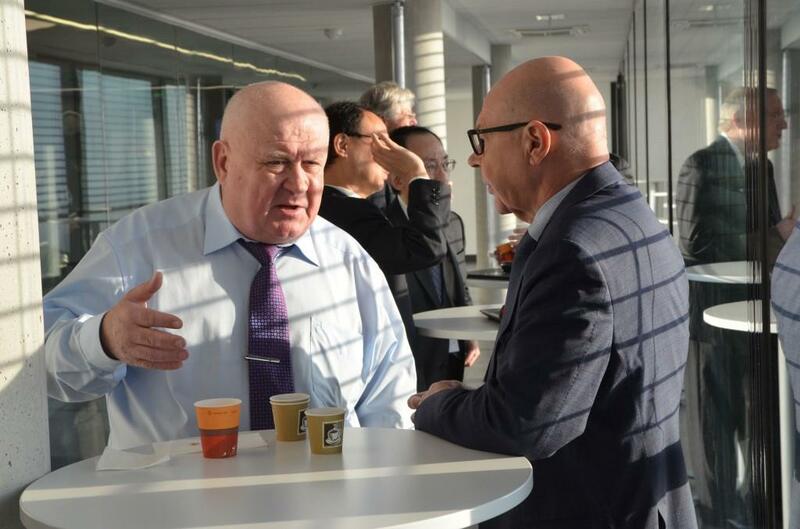 At the end of the second day, the ITER Director-General proposed a visit on site. One group of delegates can be seen here standing on the floor of the cryostat base, with the rim of the base in the background. Specifically, the Revised Construction Strategy brings all installation activities in the critical Tokamak Complex area under the coordination of the ITER Organization, including building services falling under the scope of the European Domestic Agency's TB04 contract for mechanical and electrical installation works. Instead of planning sequential installation activities in the Tokamak Complex—first TB04 building services, and then the installation of machine components and systems by ITER Organization contractors—the transfer of TB04 installation activities to the ITER Organization through the partial novation of the contract allows significant time to be saved by facilitating early access for ITER contractors and allowing the most efficient integrated assembly sequences to be developed to avoid clashes, dismantling and/or rework. 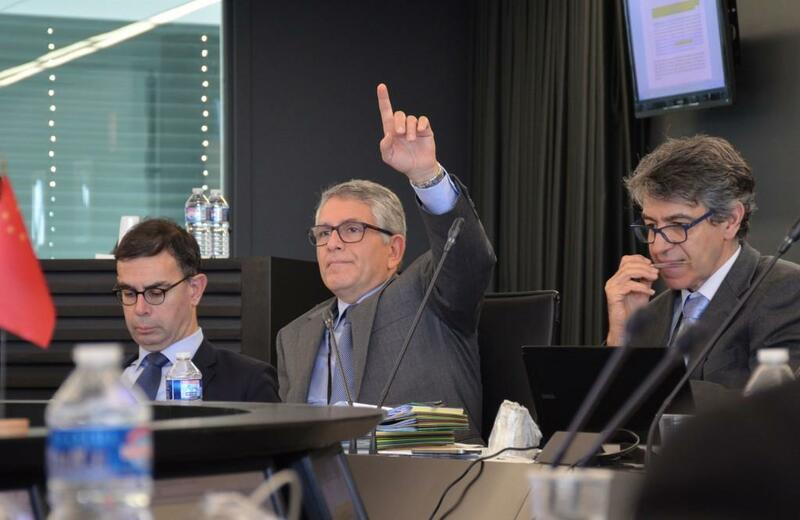 "I confirm to you that critical transitions lie ahead for the ITER Project--as we move from design, engineering and manufacturing to assembly and installation," said the ITER Director-General Bernard Bigot in his opening remarks to the 23rd ITER Council. "All the large components of the Tokamak will be arriving on site within the three next years, 2019-2021, and in parallel we will be carrying out the first steps to commission and prepare for operation. We believe that we have found the best way to adjust our overall organization to face the challenges of this transition." The first machine component—part of the magnet feeder for poloidal field coil #4—will be installed in the Tokamak Pit late November. Read the full press release in English or French. 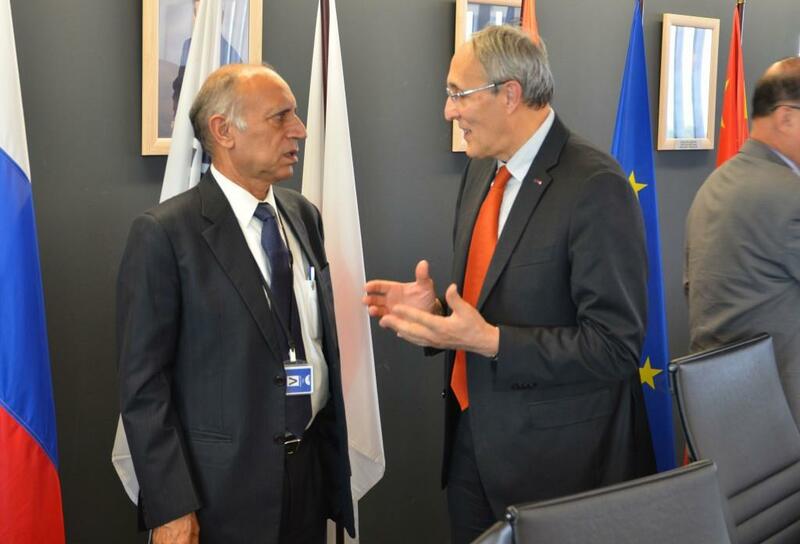 ITER Director-General Bernard Bigot in discussion with ITER Council Chair Arun Srivastava. Members of the US delegation: Ned Sauthoff, Head of the US ITER Project Office, Oak Ridge National Laboratory; Jeff Thomas, US ITER Program Manager, US Department of Energy (DOE); Cole Donovan, Foreign Affairs Officer, Office of Science and Technology Cooperation, Bureau of Oceans and International Environmental and Scientific Affairs, US Department of State; Joseph May (seated), Director of the Facilities, Operations and Projects Division. Office of Fusion Energy Sciences (FES), US DOE Office of Science; Head of Delegation Steve Binkley, Acting Director of the Office of Science, DOE; Tom Vanek, Senior Policy Advisor, Facilities, Operations and Projects Division, FES, US DOE Office of Science; Jim Van Dam, Acting Associate Director, FES, US DOE Office of Science. Head of the Japanese delegation Yoshio Yamawaki, Deputy Minister of Education, Culture, Sports, Science and Technology (MEXT); Masahiro Mori, Distinguished Research Fellow, National Institute for Quantum and Radiological Science and Technology (QST); Tomohiko Arai, Director of the International Nuclear and Fusion Energy Affairs Division, MEXT Research and Development Bureau; and Eisuke Tada, ITER Relations Coordinating Officer, Deputy Director-General. 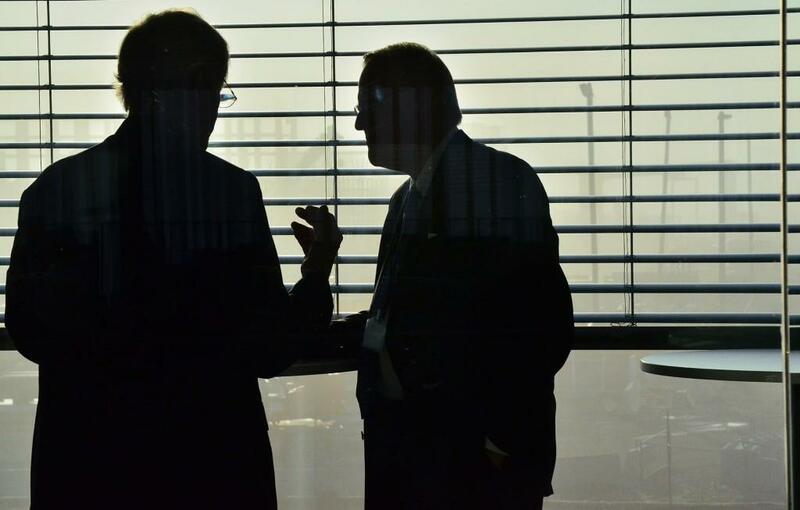 Johannes Schwemmer, Director of the European Domestic Agency Fusion for Energy; and Gerassimos Thomas, Head of the EURATOM delegation and Deputy Director-General of the Directorate-General for Energy at the European Commission. From China: Front row, left to right—Head of Delegation HUANG Wei, Vice-Minister of the Ministry of Science and Technology (MOST); interpreter GUO Anna, Project Officer for ITER China; LUO Delong, Director-General of ITER China (MOST); Back row, left to right—YANG Xuemei, Director of the MOST Department of International Cooperation; GUO Risheng, Director General, MOST Department of Resource Allocation and Management; GUO Zhiwei, Deputy Director General, MOST Department of Basic Research; SU Mingxing, Administrative Officer, Cabinet of the ITER Director-General; SUN Yuming, Minister Counsellor, Chinese Embassy in France. Representing the European Member (EURATOM): François Jacq, High Representative for ITER in France and Chairman of the French Alternative Energies and Atomic Energy Commission (CEA); Head of Delegation Gerassimos Thomas, Deputy Director-General, Directorate-General for Energy, European Commission; and Joaquin Sánchez, Chair of the Governing Board, European Domestic Agency Fusion for Energy. 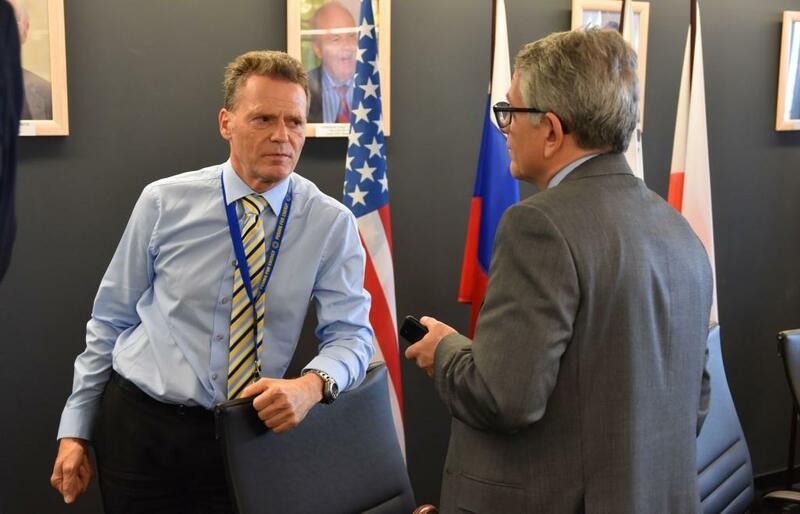 Igor Borovkov, Russian Federation Head of Delegation and Deputy Chief of Staff of the Government Executive Office; Oleg Patarakin, Chair of the ITER Council Management Advisory Committee (MAC). 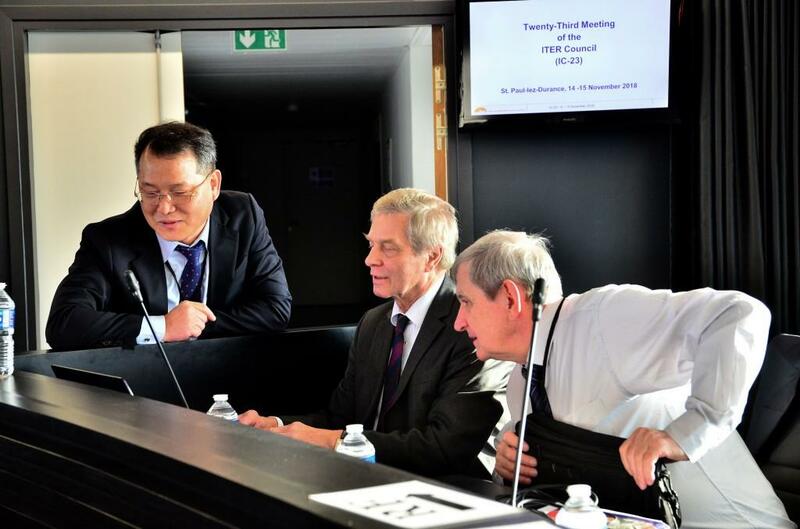 Hyeon Gon Lee, Deputy Director-General of ITER Korea, and the Deputy Heads of ITER Russia Vladimir Vlasenkov and Vitaly Korzhavin. Ned Sauthoff, Head of the US ITER Project Office, Oak Ridge National Laboratory; and Jim Van Dam, Acting Associate Director, Office of Fusion Energy Sciences, Office of Science, US Department of Energy. 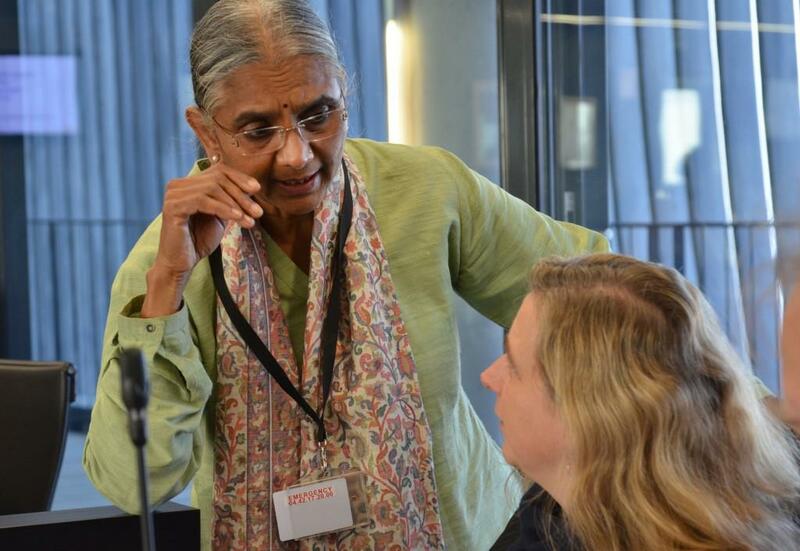 IAEA observer Meera Venkatesh, Director of the Division of Physical and Chemical Sciences, IAEA Department of Nuclear Sciences and Applications, and Council Liaison Assistant Annegret Janssen. 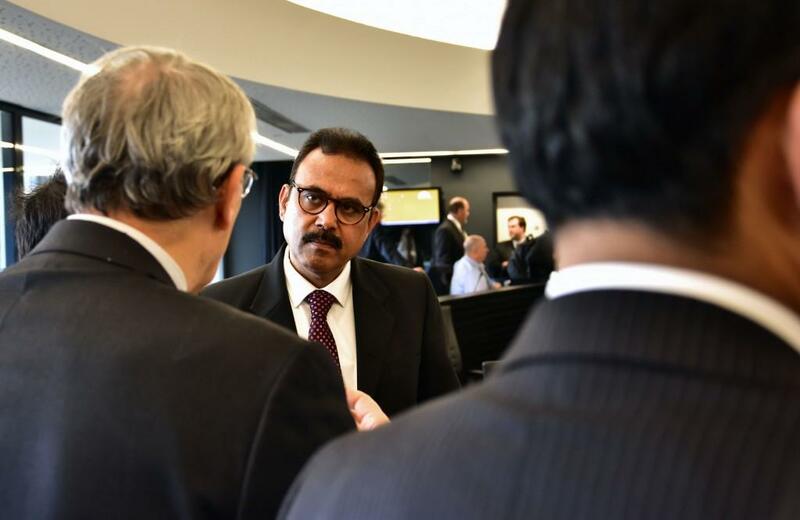 Ravi Bhushan Grover, Indian Head of Delegation and Member of the Indian Atomic Energy Commission, speaks with ITER Director-General Bernard Bigot. 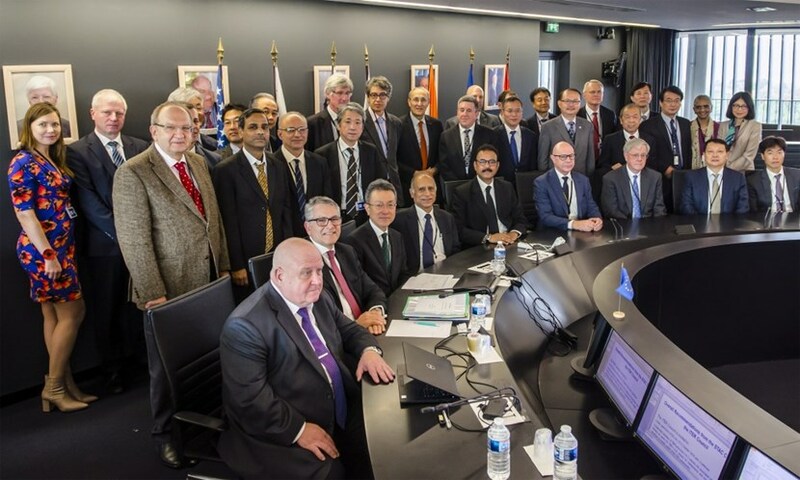 Delegates to the Twenty-Third Meeting of the ITER Council (IC-23), which convened at ITER Headquarters on 14 and 15 November 2018.